The Waldorf Astoria Trianon Palace Versailles is an exceptional woodland retreat nestled on the edge of the tranquil Royal Domain of Versailles. 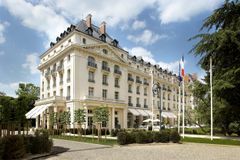 Steeped in tradition yet thoroughly contemporary, this stunning hotel offers travelling golfers gourmet dining, top class accommodation, an exclusive spa and, of course, easy access to the golfing delights of the region as well as France’s capital city of Paris. The Trianon Palace Hotel effortlessly combines the opulence and grandeur of the French renaissance with modern luxury and design in the form of its excellent selection of guestrooms that range from Classic Guestrooms to the infinitely luxurious Versailles Suite. Rooms are stylish, comfortable and feature a fantastic array of modern comforts and amenities that include wireless internet access, flat screen satellite TV, DVD and in-room movies, lavish en suite bathrooms, 24 hour room service and private balconies which are ideal for gazing out over Louis XIV's Royal Domain. Dining options at this magnificent hotel are extensive. From stylish and casual meals at La Veranda to 2 Michelin starred gourmet delights at Gordon Ramsey at Trianon guests are never too far away from a delicious and convenient meal. For the ultimate dining experience why not book your meal at the Gordon Ramsey Chef’s Table where you can gain a unique insight into exactly how much energy, expertise and passion goes into each and every dish you choose to sample. After dinner or indeed upon returning from a day on the fairways, guests can also take advantage of the Sports Club and Gallery Bars. During your time away from the cultural and golfing delights of this region of France why not treat yourself to a day at the lavish Guerlain Spa. Here guests can indulge themselves with an impressive array of treatments from the exotic Shiatsu Massage to the humble facial; or simply wash away the stresses and strains of everyday life by using the spa facilities that include an indoor heated pool, a hammam and numerous steam rooms. There is also a state of the art fitness centre for those with a sporty disposition. Golf courses in the surrounding area include the likes of the stunning Le Golf National which has been selected to host the 2018 Ryder Cup.